Case Top Box Roll Bag SET - VESPA PX GTS/GT/GTV/LX LAMBRETTA (FITS ANY CARRIER). Roll Bag SIP "Classic", for Carrier 48x30x27cm. 35 liter, brown faux leather - attaches to any carrier with clip-in-and-round straps (as seen in pictures). 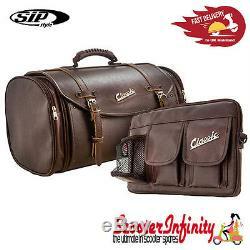 Bag SIP "Classic", for glovebox, for Vespa 360x210x30 mm, real-leather imitation, brown. The nicely shaped SIP bag / case made of nostalgic real-leather imitation is secured by mounting straps at the front/rear luggage carrier or rack. Water-repellent and stable in form. Large main compartment, side compartments for volume expansion. 4 fixing points at the bottom. 3 fixing points at the rear. To mount on luggage carriers or racks. The Ultimate in Scooter Spares, Parts & Accessories Our passion for scooters exceeds expectation - were not just a dealer, were scooter fanatics. Here at Scooter Infinity we love everything scooter related, we thrive on bringing you the latest products direct to your door from our online store. From a brake cable to an exhaust, we are partnered with all the top manufactures to bring you the ultimate items. Check out my other items. The item "Case Top Box Roll Bag SET VESPA PX GTS/GT/GTV/LX LAMBRETTA (FITS ANY CARRIER)" is in sale since Friday, July 13, 2018. This item is in the category "Vehicle Parts & Accessories\Scooter Parts\Other Scooter Parts". The seller is "scooterinfinity" and is located in Chesterfield.